A $30 million private race to the moon will lose one of its five finalists, barring a holiday miracle. 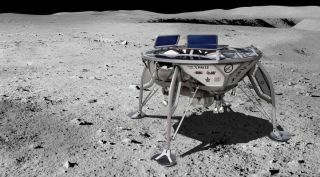 The Israeli team SpaceIL will have to drop out of the Google Lunar X Prize (GLXP) if the group cannot raise $7.5 million by Dec. 20, the last day of Hanukkah, team members said. The GLXP challenges privately funded teams to land a spacecraft on the moon, move the vehicle at least 1,640 feet (500 meters) and beam high-resolution imagery back to Earth. The first team to do this wins the $20 million grand prize — as long as the team launches by the deadline of March 31, 2018. The second team to accomplish this feat gets $5 million. Another $5 million is on offer for various other achievements, raising the prize's total purse to $30 million. More than two dozen teams have thrown their hats in the ring since the GLXP was announced a decade ago, but that field is now down to five finalists: SpaceIL, U.S.-based Moon Express, Japan's Team Hakuto, India's TeamIndus and international outfit Synergy Moon. SpaceIL initially estimated it would need about $8 million for the GLXP effort, but costs soared to $85 million, team members said. The team needs to raise $30 million by Dec. 20 to pay its bills. It has secured $22.5 million in pledges, contingent on the team's ability to raise that additional $7.5 million. SpaceIL is reaching out to "potential major donors," according to the statement, and asks anyone who may be interested in keeping the team afloat to contact Sari Brosh Rechav, SpaceIL chief operating officer and vice president of education, at Sari.Broshrechav@spaceil.com. The team hopes to trigger an "Apollo effect" in Israel and plans to use any GLXP prize money it wins to help get more Israeli kids interested in science, technology, engineering and math, SpaceIL representatives said. "The impact of our spacecraft's launch and its historic, weeks-long journey to land on the moon will resonate for years to come," Privman said.